3 years & up. 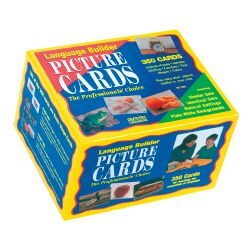 A must-have for developing children's imagination and creativity. 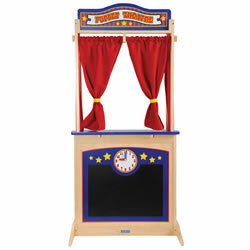 Interchangeable marquis signs turn this floor puppet theater into a store, market, or whatever children prefer by using the chalkboard sign. Below the ledge a clock with moveable hands and a chalkboard front help announce the start of the show. Curtains can be held back with hook and loop ties for an open counter appearance. 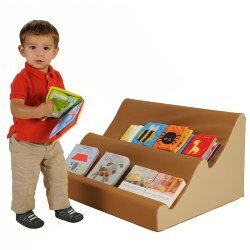 Sturdy, non-tip base and durable, wooden frame. Adult assembly required. PreK - Kindergarten. 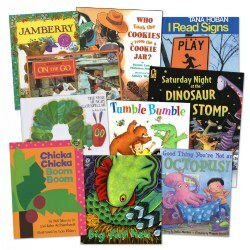 Prepare and execute a parent workshop that will empower parents to help their children preview and make predictions about events in the story. 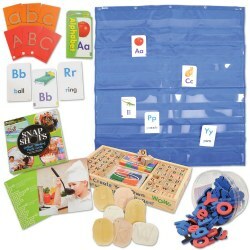 Workshop activities will also model how to retell a story to strengthen comprehension and encourage the development of phonological awareness and listening skills. 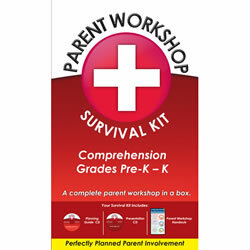 Includes 2 CD's and 30 Parent Home Literacy comprehension cards (item #14379). 12 months & up. 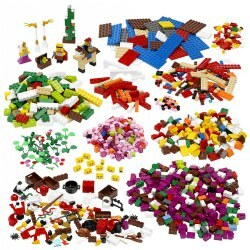 Excellent for creative role-play, career, and cultural awareness activities. 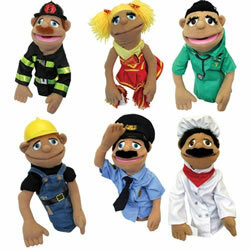 These 8 puppets have appropriate outfits which illustrate different occupations. 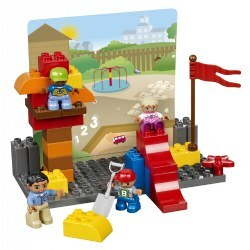 Set includes: postman, policeman, doctor, vet, fireman, chef, farmer, and construction worker. 2 years & up. 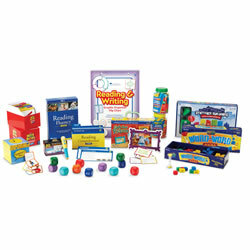 Come join the fun as you learn with the Kaplan Kids. 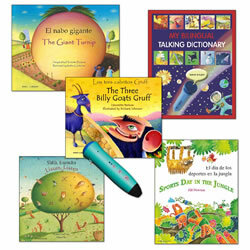 Add excitement to circle time, storytelling, language lessons and more. 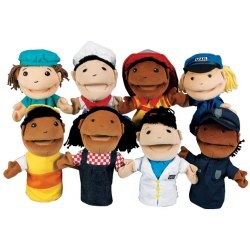 Our adorable puppets have their own personalities plus they include diversity and inclusion. 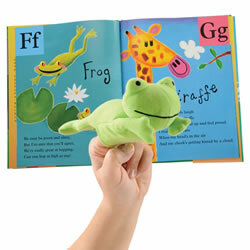 Each puppet is 14" long with a working mouth, and moveable arms and legs. 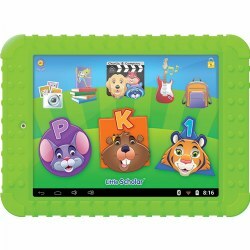 They have permanently stitched features and are made of soft plush durable polyester that is easy to clean and maintain. 3 years & up. Half body puppets have different occupations with the accessories to make them realistic. 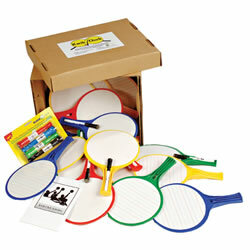 They can be used to teach children the values of having a job and one that helps people every day. Use one hand to manipulate the puppet's mouth and facial expressions while gesturing with the removable wooden rod with the other. Detachable rod is suitable for lefties or righties! Puppets are 15" high. PreK - Grade 3. 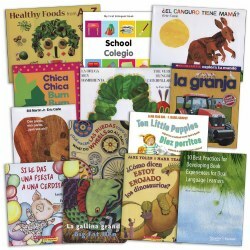 This Spanish and English Read-along set is perfect for students who are learning a new language. Word for word narration as they follow along. 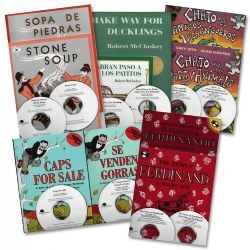 This set of 5 titles features all-time favorite books in each language. 12 months & up. 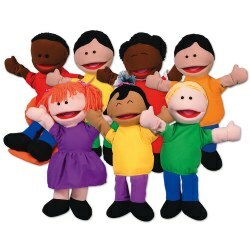 These large, 12 inch puppets have realistic features and moveable mouths for interactive play. Surface washable. 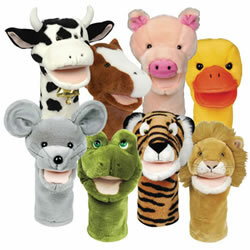 Set includes: cow, horse, pig, duck, mouse, frog, tiger, and lion puppets.